A High Leg recliner is a Type of Recliner that in itself looks Like any other recliner, but with the addition of Higher wooden or Steel Legs to the frame or base. They can have either standard, or very decorative legs, depending on the type and style of the recliner. The High Leg recliner is a more stylish and sophisticated type of recliner that looks appropriate in more formal settings and living room styles. High legs Recliners are available in a large variety of either fabric, or leather upholstery, Synthetic Fabrics and leathers, or genuine Natural fabrics and Leather can be used. These fabrics can likewise be in any color or pattern that you desire. The most traditional High leg recliners have wooden legs that may be manufactured from solid wood, Plywood, or a Metal with a wood Finish. The high leg recliner can come in almost any size and shape imaginable, though a High Leg recliner will always be taller than some of its lower profile counterparts. High Leg recliners are the more sought-after choice for formal settings and home décor than comfort, though many high Leg recliners do offer superior comfort and relaxation features. They are much easier to get in and out of. 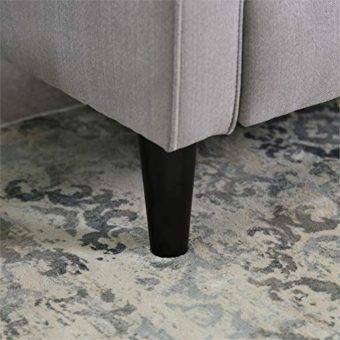 The space underneath the recliner allows you to easily clean and vacuum the floor space underneath your recliner. The High Leg recliner is a great option for taller individuals with longer legs, providing them with a comfortable upright and recline sitting position. It boasts a more traditional and classical recliner-style, if that is the look you are going for. High leg recliners are generally more space saving than their oversized flat counterparts, and will be ideal for smaller spaces and areas. Most Zero gravity recline Chairs feature High legs. Soft and comfortable padding and a comfortable seat. Durable upholstery in soft fabrics or luxury leather options. Wooden or steel legs that are lifted and higher than usual. A sturdy and tough steel or wooden frame. Other features such as adjustable recline positions, and a retractable footrest. The Modern reclining Chair from N-Bright, is a Classic Modern Styled, Sleek Leather recliner, with high wooden legs. Very high-quality construction that ensures long-lasting durability. The perfect chair for Laying Back and Sleeping On. A very Durable Wood Frame, with longer length Wooden Legs. There is ample padding in the back and armrests, with a Comfortably Cushioned Seat. Comes in a black color that will ideally blend in with any background décor. Upholstered with very easy to clean and maintain, robust leather, that will last very long. This is by far one of the most comfortable, functional, and healthy Reclining Chairs that you could ever invest in. It features higher legs along with many other comforts and health benefits, The Human Touch Perfect Chair, is surely worthy of its name in all respects. Comes upholstered in the finest quality Premium Leather, in either BLACK, COGNAC, ESPRESSO or GREY, color options for you to choose from. Walnut Wood color legs and frame, with High-Tensile Strength, as well as protection against rust and discoloration. Fluid manual recline option that uses the body’s own weight to ease into a variety of comfortable reclining positions gently. PC-LIVE 3D ease point technology, with a patented fluid-cell seat cushion which is sealed hermetically in order to displace pressure in three dimensions, using dispersing it across the entire seat surface, reducing pressure points. Features PC-LIVE PC-610 Power Omni Motion technology, Zero and anti—Gravity positions. A Fluid filled seat cushion for comfort and Jade Heating system, to soothe and relax tense muscles. There is an additional head pillow, for full support, and the armrests are extended for more comfort. The Santa Fe from Ashleigh Furniture is an absolutely majestic and classic vintage styled recliner, with delicately finished wooden details and higher leg design. Beautifully Crafted and finished offSolid Dark Wood legs and Armrests with an exquisitely carved side. The Legs are higher to give the chair a bit more sophistication. Upholstered in a Rich Brown leather with durable and striking stich details. A retractable footrest and recline mechanism for smooth and comfortable recline. This chair is ideally Small and Comppact, so it will fit well in smaller spaces. A gorgeous Vintage style with classic and elegant finishing’s, ideal for the more Traditional styled home. The Abbyson Living Alistair is an elegant and modern styled, Tufted fabric recliner with higher wooden legs, and a retractable footrest. FeaturesHigh density, and Very resilient, Foam filling that will not lose its shape. Upholstered in a soft grey colored fabric with Tufted details. A Pinewood and Plywood frame that is durable and lightweight. Adorned with beautiful button details and, delicate hand stitching, for decorative detail and style. Full recline capabilities, as well as a comfortable and padded retractable footrest for further comfort and relaxation. Available in a beige leather upholstered, or Realtree Camouflage, fabric upholstered design option. Features eight very powerful massage vibration motors, that will target four zones, full back, legs, thighs and lumbar area. A cozy and comfortableLumbar Heating System, that will soothe and relax sore and tense muscles. There are five intensity levels and nine massage modes to choose from in order for you to personalize your massage experience. Very handsomely finished off with PU leather or fabric. A durable and well constructed wooden base, with longer length at the base. Complete recline and swiveling function. Comes with an additional, fully padded Ottoman to rest your legs on. These are some superb recliners all with either Higher leg features, or a higher Base, and each with unique functional as well as decorative features to enhance your home, and give you endless hours of comfort and relaxation.